ReboundFX is simply the best choice for nutrient replacement therapy for liquid hydration and restoring energy levels on the market today. ReboundFX sports drink comes in a powder form. I personally love the ReboundFX powder as its easier to transport from game to game without needing refrigeration. With over 135 power pact quality nutrients for hydration and refueling with a cool refreshing and pleasant taste that kids will love. 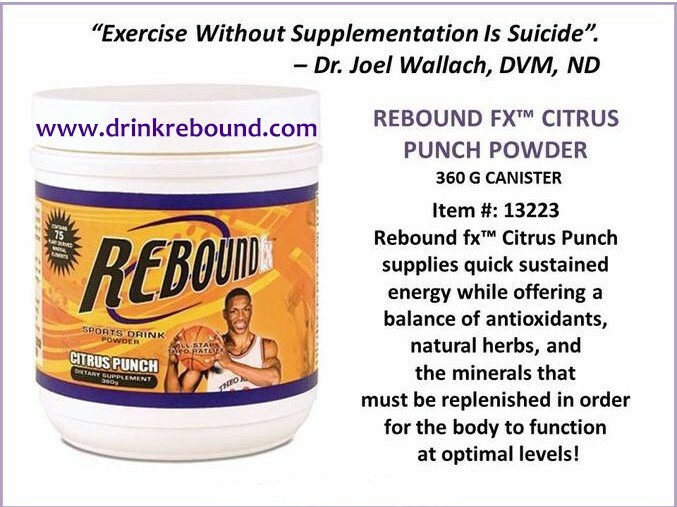 ReboundFX was created for ex-NBA athlete Theo Ratliff but designed for anyone who truly is trying to properly hydrate and replenish the nutrients they loose from when they sweat. If you were told that when we sweat that it only contain just water and salt, you weren’t told the complete truth. Understand that when we sweat, we lose a soup of dozens of essential nutrients that’s contained in our body. Those essential nutrients needs to be replenished and the typical commercialized sports drink contains so very few of them. Any sports drink can give you the basic electrolytes to keep you from passing out but ReboundFX want to give you more for about a $1.17 per 16oz serving. I think all athletes of all ages deserves from every team of all leagues deserves more, don’t you? If it’s good enough to be the Sponsored Sports Drink of the WBA League, it should be good enough for you too. These statements have not been evaluated by the FDA. This is not intended to diagnose, treat, cure, or prevent any diseases.